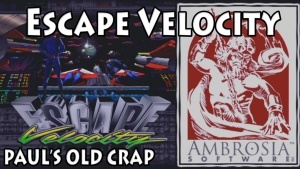 Escape Velocity is a top-down style space simulation game released in 1996 by Ambrosia Software. The game is playable on 68030 based Mac models but ideally you'd want to use a 68040 or better. The default install of the game provides numerous star systems and missions to keep you busy, but you also have the option of downloading third-party plugins to extend certain aspects of the game. Some of the larger plugins will change graphics from existing game elements while smaller plugins will simply add new ships, planets, missions. This page was last modified on 9 April 2019, at 22:22.